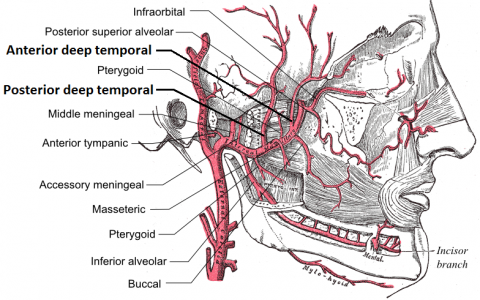 Temporal arteritis, also known as giant cell arteritis (GCA), is a systemic inflammatory vasculitis that affects medium-sized to large arteries. The main arteries involved include the medium-sized muscular arteries, such as the cranial and extracranial branches of the carotid artery. This condition is known as a condition of the elderly and is a significant cause of secondary headache in older adults. GCA is closely linked to polymyalgia rheumatica (PMR), a systemic rheumatic inflammatory disorder with unknown causes. GCA and PMR usually occur together in the same patient. GCA is the most frequent primary vasculitis, which predominantly affects Caucasian people over the age of 50. 95% of cases occur in patients older than 55 years. The incidence of GCA in 70-79 year olds is 29.6 per 100,000 individuals. Women are 2-6 times more likely to be affected than men. Giant cell arteritis occurs in at least 25% of all cases of polymyalgia rheumatica (PMR). GCA is more frequent among people of Scandinavian and Northern European descent. 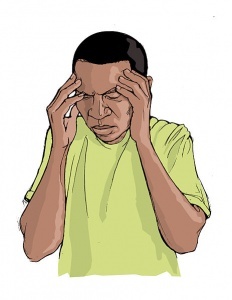 Headaches/ generalized head pain, decreased visual acuity, diplopia, decreased color vision, visual field defect, aching/ stiffness of joints, conjunctival hyperanemia, cough, corneal oedema, iritis, cranial symptoms such as jaw claudication, temporal artery tenderness, amaurosis fugax, decreased temporal pulse, and scalp pain present in the majority of cases . High dose corticosteroids are the most widely accepted medication and overall treatment for GCA. However, there is no consensus on dosage for either initial treatment or following rate of dosage reduction. Several entities such as the British Society for Rheumatology and the European League Against Rheumatism have developed guidelines on dosing based off extensive literature search- See "Medical Management" below. GCA is diagnosed on the basis of the combination of symptoms, clinical findings, laboratory results, and diagnostic imaging. The gold standard diagnostic test for GCA is a temporal artery biopsy. Increased ESR (erythrocyte sedimentation rate) >50 mm/h is one of the five American College of Rheumatology criteria for the diagnosis of GCA. CRP C-reactive protein is said to be increased in patients with GCA. It has been reported that CRP has a 100% sensitivity and when CRP is elevated in combination with ESR there is a 97% specificity. 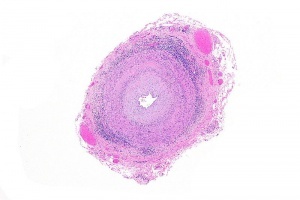 Thrombocytosis also serves as an important diagnostic tool for GCA. It has been shown that an elevated platelet may have a higher positive predictive value than ESR. In the setting of clinical suspicion and a raised ESR, thrombocytosis has a relatively high specificity for distinguishing GCA from other diseases. Newer diagnostic modalities, including ultrasound, magnetic resonance imaging, and positron emission tomography can play an important role in directing treatment in cases with negative TAB. The overall etiology of GCA is unkown. Environmental factors are suspected to be potential triggers for this disease. It is believed that the basis for the disease involves abnormalities of the arterial elasticum, with a decreased in integrity of the inner elastic membrane of affected arteries, resulting in a giant cell reaction near this elasticum. Another theory is that the initial lesion is a destruction of the muscular layers of the artery’s tunica media caused by ischemia, which leads to fragmentation of the elasticum with formation of giant cells occurring secondarily. Less common symptoms affecting only about eight percent of those with the condition include: pleural effusion, coronary vasculitis, pericarditis, myocarditis, peripheral neuropathy, hearing loss, renal arteritis, lymph node hyperplasia, and abnormal liver function, mesenteric ischemia, sore throat, choking sensation. Constitutional symptoms may include weight loss, malaise, fever, depression, and polymyalgia rheumatica, night sweats. The goal of treatment is to minimize tissue damage caused by inadequate blood flow, and the most common route of management involves use of corticosteroids such as Prednisone. Below are dosage guidelines developed by the European League Against Rheumatism . Physical Therapists should be aware of associated signs and symptoms and refer patients accordingly. Prompt initiation of treatment may prevent blindness and other ischemic related consequences.There are no current physical therapy treatment options for temporal arteritis and best management described in literature involves use of corticosteroids. 1. Colin G, Dupont M. Giant cell arteritis. Journal of the Belgian Society of Radiology. 2013;96(5):290. 2. Lockhart M, Robbin M. Case 58: Giant Cell Arteritis1. Radiology. 2003;227(2):512-515. 3. De Hertogh W, Vaes P, Versijpt J. Diagnostic work-up of an elderly patient with unilateral head and neck pain. A case report. Manual Therapy. 2013;18(6):598-601. ↑ 2.0 2.1 2.2 Goodman C, Snyder T. Differential diagnosis for physical therapists. St. Louis, Mo. : Saunders/Elsevier; 2013. ↑ 3.0 3.1 3.2 3.3 3.4 Salvarani C, Cantini F, Hunder G. Polymyalgia rheumatica and giant-cell arteritis. The Lancet. 2008;372(9634):234-245. ↑ 4.0 4.1 4.2 4.3 4.4 4.5 4.6 Kawasaki A, Purvin V. Giant cell arteritis: an updated review. Acta Ophthalmologica. 2009;87(1):13-32. ↑ 5.0 5.1 5.2 5.3 5.4 5.5 5.6 5.7 5.8 5.9 Gurwood A, Malloy K. Giant cell arteritis. Clinical and Experimental Optometry. 2002;85(1):19-26. ↑ 6.0 6.1 6.2 6.3 6.4 6.5 6.6 6.7 6.8 Smith J, Swanson J. Giant Cell Arteritis. Headache: The Journal of Head and Face Pain. 2014;54(8):1273-1289. ↑ 7.0 7.1 7.2 7.3 7.4 7.5 7.6 Wang X, Hu Z, Lu W, Tang X, Yang H, Zeng L et al. Giant cell arteritis. Rheumatol Int. 2008;29(1):1-7. ↑ Schmidt J, Warrington K. Polymyalgia Rheumatica and Giant Cell Arteritis in Older Patients. Drugs & Aging. 2011;28(8):651-666. ↑ 10.0 10.1 10.2 10.3 Ness T, Bley TA, Schmidt WA, Lamprecht P. The diagnosis and treatment of giant cell arteritis. Dtsch Arztebl Int. 2013 May 23;110(21):376-86.